NAIROBI, KENYA (THE STANDARD) -- Kenya has been caught in the middle of a bare knuckle war of words between the US and China, following negative remarks made by American Secretary of State Rex Tillerson on Africa’s appetite for Chinese loans. Tillerson’s visit to Africa has not gone down well with China, which has been increasing its grip on the continent, sparking an all-out confrontation between the world’s two richest and most powerful nations. While in Ethiopia, Washington’s top diplomat threw the first salvo by declaring that China’s engagement with Africa was encouraging dependency and corruption, and endangering natural resources. “It is important that African countries carefully consider the terms of those agreements and not forfeit their sovereignty,” Tillerson was quoted as saying by Reuters. And yesterday, China responded in kind, asking the US to keep off matters that do not concern it. Beijing’s ambassador to Nairobi Liu Xianfa said the US did not have the capacity to determine whether Kenya was benefiting from her relationship with China or not. Although Tillerson’s remarks in Addis Ababa summed Africa as a whole, the singling out of Kenya by China is quite telling about the strategic importance of Nairobi to both super powers. Kenya’s geographical location in Africa is one of its key advantages on global geopolitics and economics. “You cannot know whether the shoes fit or not until you wear them,” said Liu. Kenya, which has been caught in the middle of the spat while the US Secretary of State is still on her soil, is trying to save face. Foreign Affairs Cabinet Secretary Monica Juma on Friday told reporters that Kenya’s engagement with Beijing is in the interest of the country. “This country is engaging with partners from across the world driven by our own interest and for our own value,” said Juma while steering clear of Tillerson’s harsh comments about China’s relationship with Africa. .” Tillerson yesterday cancelled his engagements in Kenya for the day after it was reported that he fell sick. Power players are speculating that it is the US that piled pressure on President Uhuru Kenyatta and his rival Raila Odinga to call a surprise truce which was announced just hours before the plane carrying Tillerson touched down in Nairobi. China, which has a policy of non-interference on political matters in the countries it gives loans at market prices, has criticized America’s perceived role in the Uhuru-Raila new found unity. “Kenya needs no foreign intervention or preaching,” said Liu. Washington, which is jittery about China’s expanding economic and political influence in Africa, is on a damage control mode and is trying to mend its relationship with the continent. Things hit a low in January when President Donald Trump made derogatory remarks about the continent. 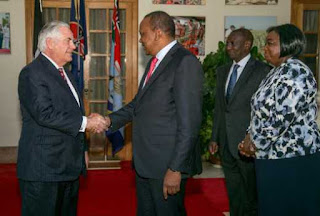 Seeking to heal the rift, Tillerson who leaves Nairobi tomorrow has been dishing out goodies in Africa this week, including promising $533 million (Sh53 billion) in aid. This is however a drop in the ocean when you compare it to the amount of money given in form of loans to African countries by China in the last decade. Liu said. “Making empty talk is harmful to the nation, while doing practical work can help it thrive. ” The US remains the leading aid donor to Kenya but China surpassed it as a trade partner in 2010. Kenya is one of the largest recipients of economic aid from the United States. Last year, the country received $632 million (Sh65.1 billion) as economic aid and $468 million (Sh48.2 billion) for other programmes such as HIV and Aids management, energy, fight against terror and agriculture. The US has also injected billions of shillings into Kenya’s battle against terrorism, which the country is keen to maintain. The US is also the second largest buyer of Kenyan products after Uganda. Last year, Americans bought $574 million (Sh57 billion) worth of Kenyan goods. America’s imports from Kenya include coffee, titanium ores and textiles through the duty free trade pact - the African Growth and Opportunity Act (Agoa). On the other hand, China is Kenya’s biggest creditor, having advanced to us Sh520 billion ($5.2 billion) for the period ending December 2017. The Asian super power is also Kenya’s largest exporter. At least Sh400 billion worth of goods from China get into the Kenyan market annually, while the Asian nation takes in a paltry Sh8 billion worth of products from Kenya every year. This imbalance in trade and huge appetite for Chinese loans by Kenya has attracted several warnings, including from the IMF and World Bank who term them unsustainable. A recent report by the Washington-based think tank, Center for Global Development, said China’s mega projects pose a significant risk of debt distress to low-income countries, including Kenya. “The primary concern is that an $8 trillion initiative will leave countries with debt ‘overhangs’ that will impede sound public investment and economic growth more generally,” said the report, adding that the problems will create an unfavourable degree of dependency on China.